For media inquiries, please contact: (505) 600-1297 or email: trish@teeniors.com. Check out Teeniors on KUNM radio discussing jobs for teens on "Let's Talk New Mexico". We're in Albuquerque the Magazine™! Teeniors™ and our founder Trish Lopez have a 3-page spread in their recent "Best of the City" issue! Thank you Albuquerque Journal for covering ﻿Teeniors' partnership with Comcast﻿! See full article by Millennial Magazine. See full article by Santa Fe New Mexican. Click the June 3rd show! See full article by Albuquerque Journal. See full article by Rio Rancho Observer. TakePart operates as a digital hub for Participant Media, a leading entertainment company that has produced more than 75 films, such as the documentaries “An Inconvenient Truth” and “Food Inc.,” and feature movies like “Lincoln” and “Spotlight.” TakePart is filming a short documentary-style video about Teeniors and its founder, Trish Lopez, that will be highlighted on TakePart’s website, in its newsletter and on its social media channels. They will also publish weekly blogs, photos and other social media updates about Teeniors to allow TakePart’s audience to follow Teeniors’ progress after winning the Make Better Today award. ​Lawrence Wong of Participant Media said Teeniors was the “perfect candidate” in the competition, because it’s using technology creatively to make seniors’ lives better while also providing part-time jobs for teens. “That in turn creates great relationships between the teens and seniors,” Wong said in an email. Technology is ever changing and it can be hard to keep up, especially for seniors. A local start-up has been helping older folks in Albuquerque by pairing them up with teens. This weekend, they’re focusing their efforts on veterans. “Yes, at the drop of a hat, I mean you turn around and they’re always coming out with something new,” Tom Foucher, Vietnam Veteran said. It’s a fast evolving field. “It’s just unbelievable, the way technology has been jumping by leaps and bounds,” Foucher said. The 73-year-old Vietnam veteran added, it can be a real struggle. It makes it impossible to keep up, that’s where these 'Teeniors' helping seniors is really a great deal,” he said. From video chatting, to social media, even texting or simply email, these Teeniors as they call themselves, are a huge help when it comes to technology. “We are helping veterans because there a lot veteran seniors who need this kind of help and they need… personal connection and we are here to provide it,” Teenior Eli Stone said. Every month, Teeniors offers up their services for free. This weekend, veterans are benefiting. “I think it’s great that they’re offering this service to veterans,” said Foucher, who is getting up to date on the latest Windows operating system. “It is such a heartwarming experience to be able to teach someone especially a veteran how to use something that they’re wondering about and also to talk with them and to connect with them,” Stone said. Teeniors has provided help to more than 300 seniors in Albuquerque since they launched last year. ​See full video by KRQE News 13. We were honored to be 1 of the NM startups that pitched for South by Southwest (SXSW) tickets at the Scrappy Startup Challenge in Downtown Albuquerque last month, and to have won a pass to SXSW + 3 months free office space at Fat Pipe ABQ. Thanks to New Mexico Tech Council for this opportunity and congratulations to all the teams! See article by Albuquerque Journal. Click here for full article by Albuquerque Business First. See below for full articles by Albuquerque Business First.  Teeniors CEO Trish Lopez featured as one of "3 New Mexicans to Know"
See full article by Albuquerque Business First. See video clip by KOAT News 7. 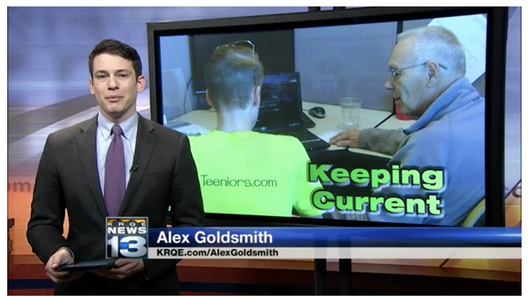 ALBUQUERQUE—Today the Walgreens store on Coors & Sequoia announced they are teaming up with Teeniors℠, an award-winning local startup company that connects tech-savvy teens with senior citizens (or any one else) for personalized, one-on-one coaching. On Tuesday, April 5th from 11:00am-3:00pm, Teeniors will provide free coaching to all attendees who need help understanding their cell phones, tablets or computers. No RSVP is necessary and the event is open to the public. Attendees need only bring their tech device and list of questions to be tutored on everything from social media to photo sharing, texting, email, learning new software and more. On the first Tuesday of each month, Walgreens stores across the country offer senior discounts to shoppers 55 and older. Local Manager Rod Walter read about Teeniors and thought it would be an ideal service to provide his customers. Teeniors provides basic tech coaching through private sessions and group events at an affordable cost. Founder Trish Lopez pitched the idea last summer at a women’s business event, inspired by her own mom’s struggle to adapt to the digital world. Since then, Teeniors’ coaches have helped well over 200 seniors in Albuquerque and Rio Rancho. They have also provided paid, part-time work to 35 local teens and millennials, while fielding hundreds more applications from those who love its mission. Lopez says it’s the kids who impress her more than anyone. “I’m so impressed by the hearts and minds of the young adults we work with. Their patience, their kindness — the impact they’ve had on our elders in New Mexico is astounding”, she said. Lopez was also humbled by the interest from Walgreens. “Walgreens asked, and we’re happy to deliver. It’s a fantastic opportunity to serve more adults in Albuquerque and to gain more experience as a new startup business,” said Lopez. In addition to coaching attendees on their devices, Teeniors will assist anyone interested in learning their website application that allows customers to refill prescriptions, order items and set medication reminders from the convenience of their smart phone or tablet. Teeniors & Walgreens present: Free Tech Coaching for Seniors! No RSVP required to attend! All attendees will be coached on a first-come, first served basis. For more information, call (505) 600-1297. Tech-savvy Jeremy Chavez, 19, works for Teeniors, a new Albuquerque company that pairs tech-savvy teens with seniors, providing one-on-one coaching sessions to teach them how to use their mobile devices. Chavez has had a series of Android devices and he points out some characteristics of Android phones that are not available on iPhones. You can insert SD (secure digital) memory cards to provide extra storage for Android and Windows phone devices. Also, like old flip phones, you can remove the back of the Android and Windows phone devices to take out and replace batteries. “That’s good if you’ve got lots of music and pictures,” Chavez said. He likes the way Android provides remote storage for music, photos and documents in the Google Drive app that comes pre-loaded on some handset models. Google Drive users get 15 gigabytes of free storage space. Apple’s iCloud storage functionality comes with 5 gigabytes of free storage. Additional storage costs 99 cents per months for up to 50 gigs of space in iCloud versus $1.99 per month for 100 gigs with Google Drive. Google Drive can be downloaded to iPhones and iPads. Another Teenior coach, Savannah Coronel, 14, has a Nokia Windows phone. Teeniors CEO Trish Lopez said some of her seniors clients have appreciated that the screen icons are larger and easier to read than on iPhones and Android phones. One downside Coronel noted was that some popular apps like Snapchat, the mobile messaging service that sends a photo or video to someone that lasts only up to 10 seconds before it disappears, are not available on Windows phones. Coronel’s Windows phone uses the OneDrive app for remote storage. Microsoft is scheduled to reduce the amount of OneDrive free storage from 15 gigs to 5 gigs early this year and require users to pay $2 per month for 50 gig of additional storage. These remote storage functions allow users to share photos, music and more between user’s phone, tablet and desktop devices. Google Drive requires users to create an account. iCloud is tied to the user’s Apple ID and the email address associated with that ID. The Apple ID is also used to buy or download apps from the App store or iTunes. If you have multiple devices, it’s important to use the same ID and password if you want to share information. See full article with fellow NM entrepreneurs by Albuquerque Journal. Teeniors Founder Trish Lopez gives ABQ Business First the Teeniors elevator pitch. See full article and video. Click above for video clip by KRQE News 13. An Albuquerque startup, Teeniors, has begun offering technology coaching by teenagers for seniors. It will offer free sessions on using smartphones at Bear Canyon Senior Center, 4645 Pitt NE, at 10 a.m. today and at Silver Horizons New Mexico, 3540 Pan American Freeway NE, from 9 a.m. to 11 a.m. on Saturday. Teeniors founder and CEO Trish Lopez and her team won first place at the Startup Weekend Women’s event earlier this year. She later pitched the idea to ABQid, a business accelerator funded by the city. Through an investment of $20,000 and weekly mentoring sessions, Teeniors has been perfecting their business model with seniors. Teeniors is offering limited time private coaching sessions by tech-saavy teens for $20/hour; in the fall, the regular price will start at $40/hour. Residents can contact Teeniors at teeniors.com or by calling (505) 600-1297. 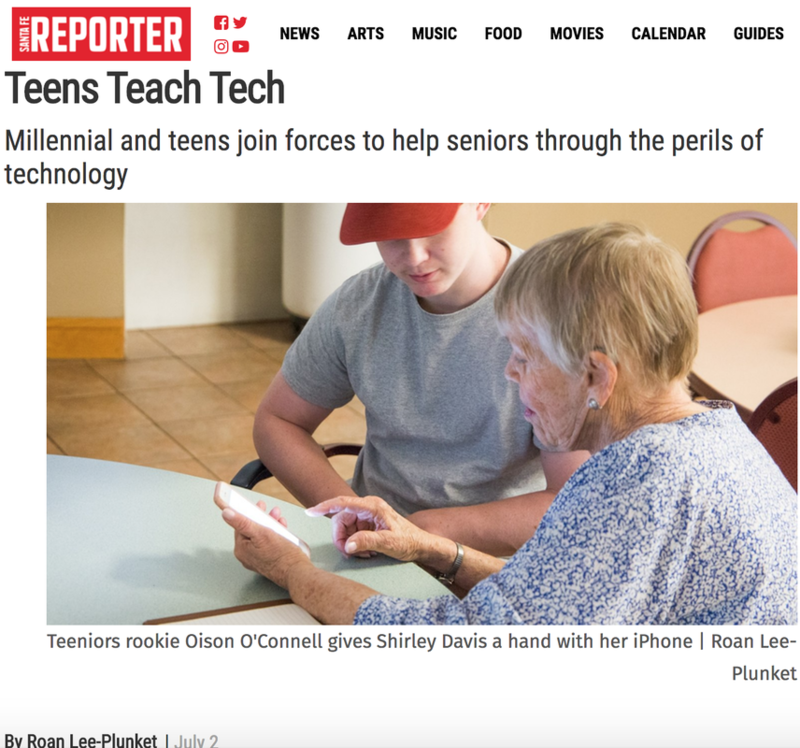 ALBUQUERQUE–A clever and successful new startup called “Teeniors" has hit the streets of Albuquerque as one of the few businesses across the country aimed at helping senior citizens through the skill set of teens: by pairing tech-savvy teens with seniors who want personal, one-on-one coaching with their tech devices. In less than a month since forming as an LLC, “Teeniors” has launched a city-wide series of events and is seeing interest from people inside and outside the state. This week, they’re offering free events across Albuquerque, “Seniors with Smartphones”, starting at Bear Canyon Senior Center on Thursday, August 6th and Silver Horizons New Mexico on Saturday, August 8th. 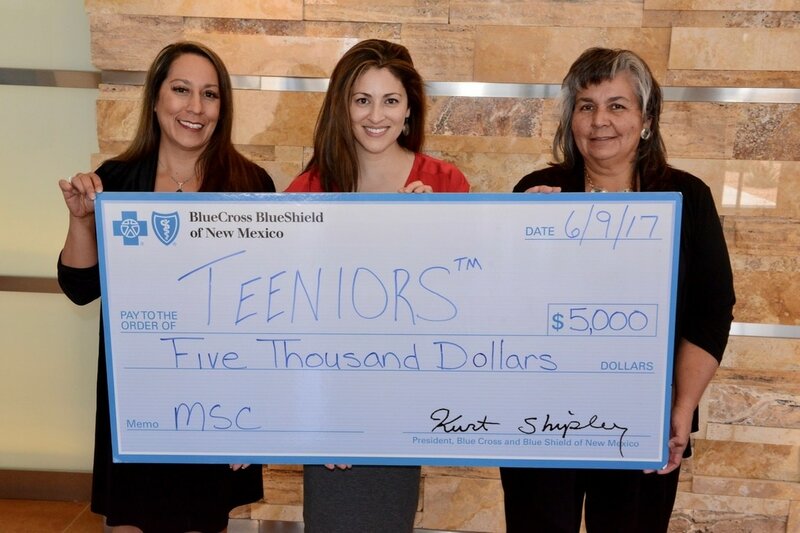 Teeniors founder and CEO Trish Lopez pitched the idea of tech-savvy teens helping seniors at the first ever Startup Weekend Women’s event in New Mexico this year. Her team won 1st place; and she later pitched the idea to ABQid Business Accelerator, an entrepreneurial training ground funded by the City of Albuquerque. Through an investment of $20,000 and weekly mentoring sessions, Teeniors has been researching, validating and perfecting the popular new business model with hundreds of seniors. 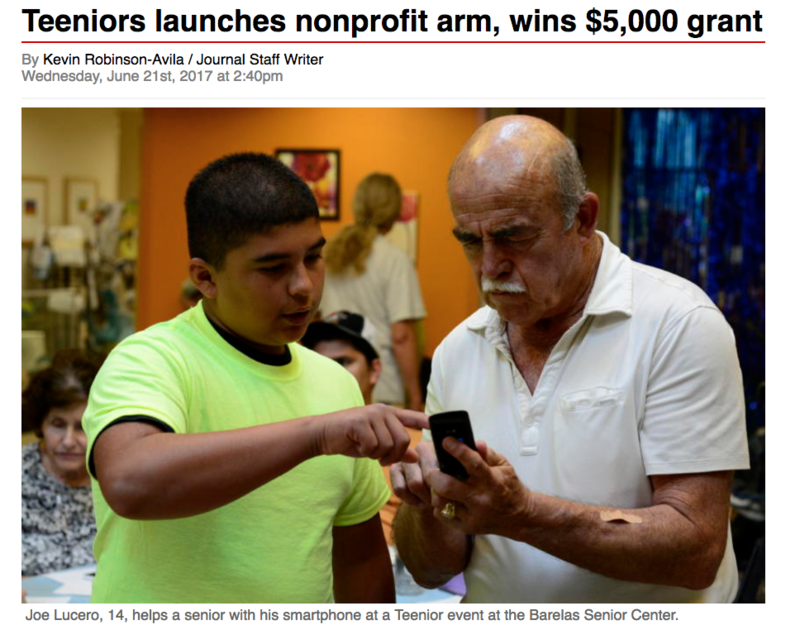 In July, they held their first public event at Barelas Senior Center in the South Valley, where 21 elders received free, custom, one-on-one coaching by local teens in sessions that ranged from 15 min to 90 min, and involved questions from learning to text to understanding what every app on an iPhone can do. A newcomer to the entrepreneurial world, Lopez is a native New Mexican and a professional in the film industry who was born and raised in Belen. She left New Mexico during college to intern at Sony Studios in Los Angeles, and was later selected by Warner Bros to take part in their Global Management Training Program. She continued on to work in Hollywood before returning home to serve as a film and media advisor to Governor Richardson’s office. She had never heard the word “startup” prior to this experience and had no aspirations to become an entrepreneur. If Teeniors proves successful, Lopez’s long-term goal is to grow the business and employ many others along the way. With their first paying client, the customer discovery and market validation is coming faster than expected. And as more adults over 50 are using cell phones, tablets and computers, the idea that seemed unlikely to compete with the hot new apps of 2015 is proving to be a hit among locals. NM residents can contact Teeniors directly by visiting their website (teeniors.com) or calling (505) 600-1297. You can also see recent photos of Teeniors’ events or follow their progress online at Twitter, Facebook, Instagram and Tumblr. Teeniors is a startup launch at Startup Weekend Women in Albuquerque that matches seniors with tech-related needs and teens who have those skills. Teeniors is currently in the ABQid Accelerator. Here Eric Renz-Whitmore talks with Teeniors CEO & Founder Trish Lopez. Webb Johnson, Managing Director of ABQid Business Accelerator, discusses the importance of new businesses actually getting out and talking to customers with Eric Renz-Whitmore.